Hoshea (hoh SHEE uh) was the last king of Israel, the Northern Kingdom. King Hoshea did very evil things, but he still wasn’t as evil as the kings who ruled Israel before him. One day, the king of Assyria and his army attacked Israel. Hoshea had kept peace with Assyria by paying the king to leave Israel alone. Hoshea had to do whatever the king of Assyria told him to do. Instead of asking God to help His people, Hoshea secretly talked to the king of Egypt. Hoshea asked the king of Egypt to protect Israel from Assyria. Now that Hoshea had a deal with Egypt, he stopped giving money to the king of Assyria. The king of Assyria arrested Hoshea and threw him into prison. Then Assyria’s army invaded Israel. The army surrounded the city of Samaria, the capital of Israel. Samaria had a strong wall around the city. For three years, the Assyrians attacked the city. They did not let anyone bring supplies into the city. Finally, the king of Assyria captured Samaria and forced the people to leave their homes. He bound them together with ropes and hooks, and he made them walk hundreds of miles to Assyria. God allowed His people to be exiled because they had sinned against Him. Even though God had rescued the Israelites from slavery in Egypt and had taken care of them, they forgot about God. They acted in the same way as the nations who did not know and love God. They worshiped people and things that were not God, and they did exactly what God told them not to do. 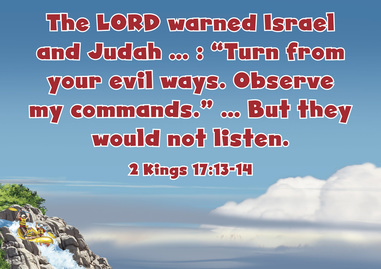 God warned His people through the prophets to stop doing evil things but they did not listen. 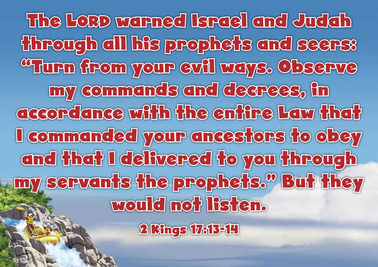 The prophets said bad things would happen if they did not obey God. When the people heard this, they sinned even more! God had had enough. He was angry with His people because of their sin. God punished the people of Israel by letting their enemies take over and force them out of their homes. All of this happened after King Solomon had died and Israel split into two kingdoms. The people of Israel had made Jeroboam their king, and Jeroboam led them away from God. The people of Israel sinned all the time. They ignored God’s warnings. Finally, God took action. God turned away from them and the people of Israel were exiled to Assyria.